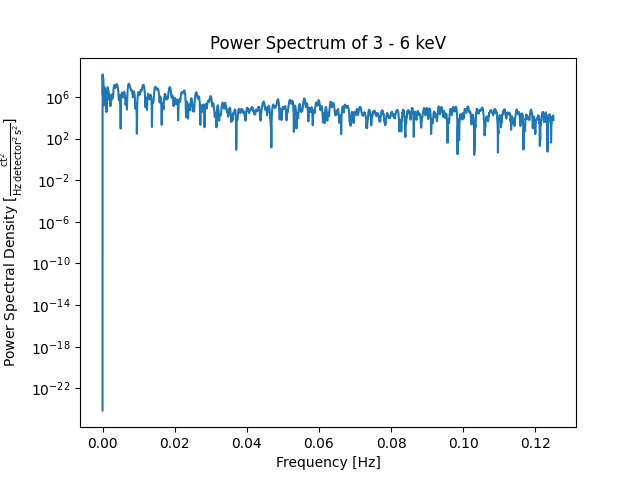 An example showing how to estimate the power spectrum of a TimeSeries. Let’s first load a RHESSI TimeSeries from SunPy’s sample data. This data contains 9 columns, which are evenly sampled with a time step of 4 seconds. We now use SciPy’s periodogram to estimate the power spectra of the first column of the Timeseries. The first column contains X-Ray emmisions in the range of 3-6 keV. An alterantive version is Astropy’s LombScargle periodogram. # The suitable value for fs would be 0.25 Hz as the time step is 4 s.